Taipei Li-Yuan Chinese Opera Theater, featuring, “ The woman who went mad upon loosing a son” is a 30 minutes contemporary dance, performed by Huang Yu-lin & Chang Hsue-hong. 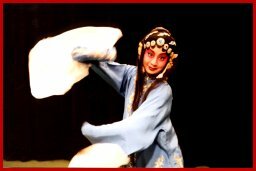 This is a unique Chinese operatic dance with the unique movements of the 36 inches-long "water sleeves" of white silk. Lady Hu, concubine of a county officer, gave birth to a son on her way of fleeing enemies. She was captured by a robber and upon being released by the robber’s wife, could not find her baby boy. This excerpt describes how she runs wildly in a forest looking for the baby and goes mad over the loss of a son.